With Doctor's visits being so expensive I have decided ti is best to try and treat non serious conditions at home. It's way cheaper with the same results and in some cases better results. I mean if I had a serious cut that needed stitches I would visit a Doctor. If I had a serious illness I would visit a doctor. But for my migraine headaches I have started taking natural remedies as well as for other things and they seem to help. Even the meds I got from the Doctor did not always make a migraine go away. 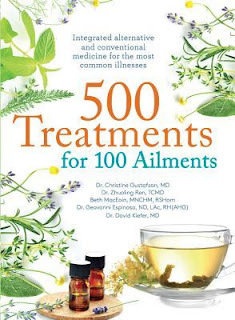 I am collecting books on natural remedies so to speak and trying the different cure listed and have found several that work really well for multiple things, and keeps my out of the Doctor's office and money in my pocket. I wholeheartedly believe in natural cure and essential oils as I have used some all of my life. This book is filled with 500 cures for 100 different ailments. I love that there is more than one option to try. Sometimes the cure does not work for someone or there is an allergic reaction to a certain herb. Take my daughter for instance she is allergic to Lavender. Anytime she is near it she starts sneezing, coughing, and her eyes water. If she touches it she can have a slight rash to full blown hives. So if there was a single cure using lavender we would not be able to try it. This book is very informative and a great book to add to your reference library.